The only one I can recall was Nicolae Ceauşescu of Romania. His execution was by firing squad on December 25, 1989. That was one big year seemingly around the world. 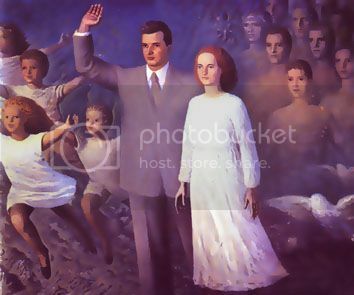 Oh yeah I'll have to admit that this painting (propaganda painting if you will) is kind of scary. Anyway back to my thought here. President George Bush invaded Panama to arrest their dictator Manuel Noriega. The Chinese were engaged in something of a revolt against the Communist regime of China in Tiannamen Square. That was one event I remember for sure more than any other event. Even the fall of the Berlin Wall which also occured on November 9, 1989!!! Anyway Saddam Hussein's hanging reminded me of Ceauşescu's execution. Of course there isn't much comparison he got caught up in a revolution while Saddam happened to have lost his nation thanks to a foreign invasion. No doubt however that both were definitely subject of an angry population and both were executed by their own people. A rough way to go don't you think?